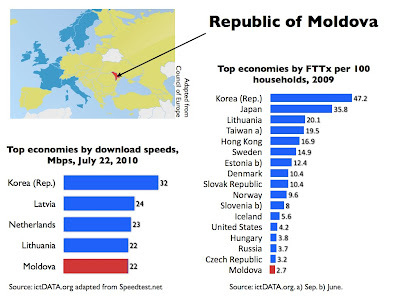 The landlocked central European Republic of Moldova, once part of the Soviet Union, ranks high in several broadband infrastructure metrics. 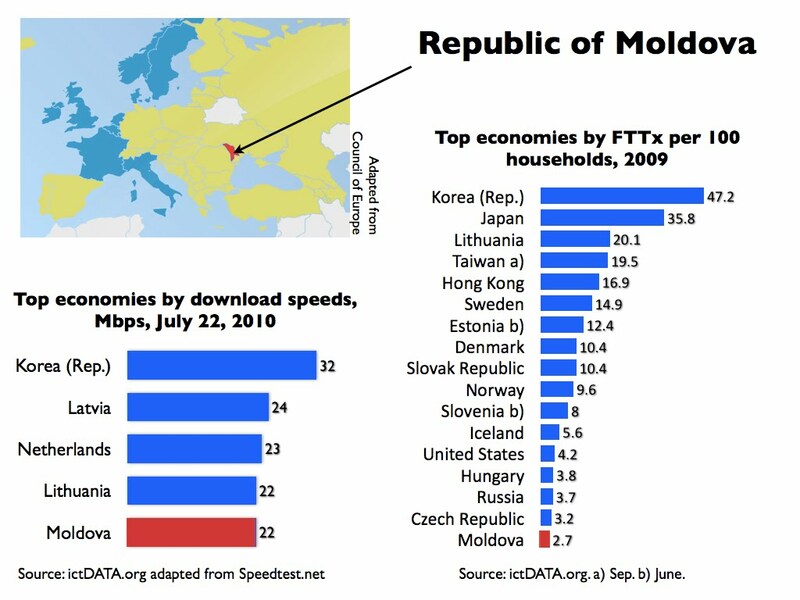 It is 17th in the percentage of homes with fiber access and according to Speedtest.net, Moldova has the 5th fastest Internet download speed in the world. Dial-up access is close to being eliminated, falling from almost three quarters of fixed Internet subscriptions in 2006 to less than ten percent by the end of 2009. Moldova's success should provide encouragement to other countries since it shows that a newcomer can crack into the top of ICT infrastructure rankings. Nonetheless, overall broadband accessibility in Moldova remains relatively low compared to other European nations and there is a big gap between the capital and other parts of the country. Some 43% of homes in the capital Chisinau had broadband access at the end of 2009 compared to 17% for the country as a whole. Reference: ANRCETI. 2010. Report On Activity of the National Regulatory Agency for Electronic Communications and Information Technology and Evolution of Electronic Communications Markets in 2009.